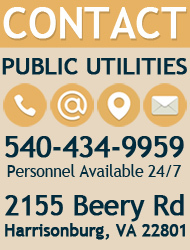 If you suspect your home has a leak and have difficulty locating it, you may contact the Department of Public Utilities at 540-434-9959 to make an appointment with a service technician or consult a qualified plumber. The City is not responsible for the plumbing in a customer's house. Leaks in toilets, faucets, ice makers, and lawn sprinklers usually cause high water usage. Toilets are most often the cause. To test for leaks, take the lid off the tank, add food coloring, and do not flush. Check the bowl one hour later to see if dyed water has seeped into the bowl. If dye appears in the bowl, a leak exists. In the event you experience difficulties locating a leak, please consult a qualified plumber. The City cannot ensure your premises against damage from line breaks or sewer overflows. However, such insurance is available as an add-on through standard homeowner's insurance policies. The City recommends all customers to purchase this insurance. The Department of Public Utilities can assist customers who experience an excessively high monthly increase in a water and sewer bill. City Code Section 7-4-9 explains (a) the procedures to determine the location of the leak, (b) the qualification for adjustments, (c) adjustment limitations, and (d) the validation of adjustment. Please complete this [116KB] Adjustment Application Form and return it to the Department of Public Utilities for qualifying adjustments. 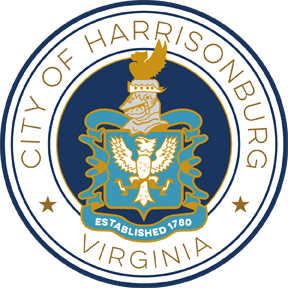 In accordance with Ordinance 7-4-1 of the City of Harrisonburg, any customer has the right to request that the meter through which water is being furnished be examined and tested for accuracy. Such consumer shall make application in writing and with such application shall agree to a fee of twenty-five dollars ($25.00) for meters less than 2” in size or one hundred fifty dollars ($150.00) for meters 2” and above in size to be added to customer’s water bill prior to test. In the event such inspection reveals said meter was registering inaccurately, not functioning within standards set for by the American Water Works Association (AWWA), said fee shall be waived and adjustment made for inaccurate reading. In testing, meters may be removed from the line and replaced by a tested meter. If removed, the meter shall be tested at the Public Utilities office, located on 2155 Beery Road, Harrisonburg, VA 22801. Meters may also be tested and re-calibrated in place without removal and replacement. All meters shall be removed, replaced, tested or calibrated during the regular hours of business unless the customer will pay the overtime and added expenses, whether the meter passes or fails the test. Please complete this [112KB] Request for Meter Test Application and return it to the Department of Public Utilities.